Monday night Ohio Governor John Kasich delivered his state of the state speech. All of these things have helped Ohio move up to higher, more solid ground, and, if you look, the clouds are moving apart and the sun is beginning to shine, and we can get a glimpse of the summit ahead. We’ve got much further to go, but the success we’ve had gives us the confidence to climb higher. We’re not hopeless, we’re hopeful. We’re not wandering, we have direction. Let’s keep going. As an Ohioan, I’d like to tell a different story. It’s a story that appears in bits and pieces in city & school financial reports, in letters to the editor and editorials, in economic analyses, but the full story has largely hid from public sight because it’s not a single sensationalist event. It’s not a story about a person or administration because you have to go back further than that to see the pattern. You have to go back further than that to see how a state gets budgeted back to the stone age. The pattern is simple but takes place over a long period of time: shift tax burden, create deficit, blame government, defund government, repeat. And unfortunately, it’s a story that’s not just happening in Ohio, but at a national level and in many states across the nation because it’s being pushed by influential corporate groups like the American Legislative Exchange Council (ALEC). The Ohio General Assembly passed House Bill 66 promising to improve economic conditions for Ohioans. H.B. 66 eliminated the corporate income tax and reduced state income taxes by 21%. At this time last year we had a tax code that was mired in the distant past, punishing investment and ignoring innovation. We worked day and night to bring that code into the 21st Century. We cut the income tax. We junked the corporate franchise tax. We scrapped the inventory and equipment tax. The promise was jobs and growth. Most Ohioans got little benefit from the tax overhaul. Middle-income Ohioans receive, on average, a refund of $182 a year. The income tax cuts most benefit the wealthy — Ohio’s top 1 percent typically get $10,000 a year in state tax relief — while services that low-wage earners especially rely on get cut. Did H.B. 66 work? Did it create jobs? In April 2013, Policy Matters Ohio looked at the data to see how Ohio was performing versus other states. The report is not great. From 2005 to 2013, we’ve had a 4.4% decline and have lost 238,000 jobs. Over the same period, despite the recession, the nation managed a 1.2% increase. Ohio missed out on pre-recession growth and has been slower to recover. Overall, Ohio ranked fourth-worst in the nation. In June 2005, income-tax rates were cut 21 percent and major business taxes were slashed. Whether one begins with the approval date, the beginning or end of the recession, or since the beginning of this administration in January 2011, the results have been the same: The Ohio job market underperformed the nation. Since June 2005, we have lost a greater share of our jobs than all but two other states, Rhode Island and Michigan. Since January 2011, Ohio private-sector employment growth has trailed behind the country’s, at 3.97 percent compared to the U.S. increase of 6.44 percent. Nine years after the 2005 tax cuts, we trail the rest of the nation on growth and jobs. In the recent Gallup well-being index, Ohio ranked 46th out of 50 states in 2013. The story doesn’t end with the 2005 tax cuts though. In 2010, Ohio elected a new governor and state legislature. After winning election in 2010, Governor John Kasich introduced his “jobs budget”: H.B. 153. He claimed there was an $8 billion deficit and proposed massive cuts to local governments and schools. The following chart shows the impact of his cuts to the Local Government Fund (LGF). The LGF funds are distributed to cities and municipalities throughout the state. 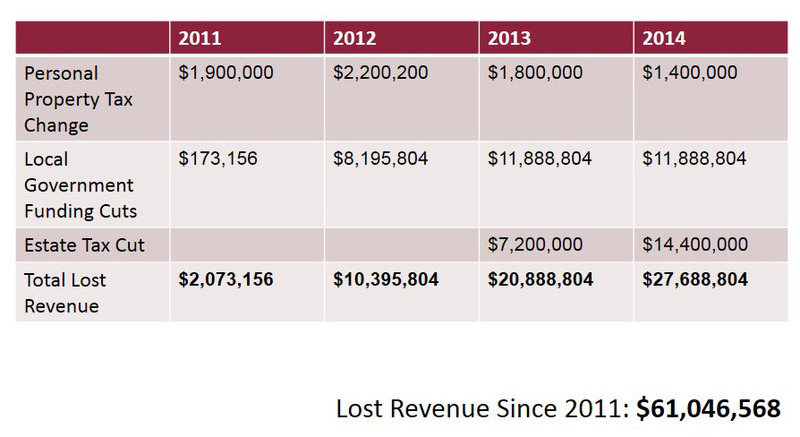 Casino money was dangled before local communities as a way to make up the difference, but as the following chart shows, it hasn’t. Let’s look at Cincinnati to see how this impacted one of Ohio’s cities. 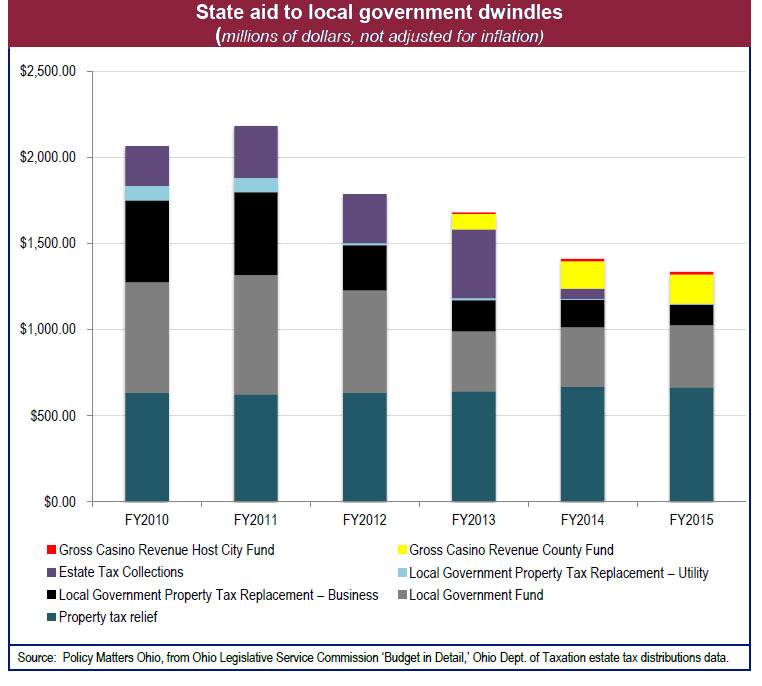 The following table shows the cuts to the local government fund (GRF) from eliminating the estate tax and from changes to the personal property tax. If we did not have the loss of these three income sources, the City of Cincinnati’s short-term budget outlook would be very different. In fact, we could essentially be balanced without extraordinary measures. The cumulative effect of all the permanent and one-time cuts that have been made over the past several years are still being felt. As a result service delivery and performance in many areas is slower and occurs without enough people, requiring a focused effort to keep errors to a minimum. A good example of this is the Purchasing Division in the Finance Department. In 2007, there were six employees serving as buyers to help procure services and goods under contract. In 2012, there are four, a difference of 4,176 hours of staff time lost per year in that area. Contracts for services such as street rehabilitation, demolitions, and professional services now take longer to process. … To balance this budget exclusively with cuts would require the elimination of 344 positions. This, after the size of city government has been cut roughly in half since the 1990s according to David Mann, Cincinnati’s vice mayor. Since 2000 alone, according to the city report Striving for Structural Balance: Assumptions and Options, full-time employees in recreation have been cut by 43%, transportation and engineering by 62%, IT solutions by nearly 75%, public services by 43%, finance by 43%, and the city manager’s office by over 40%. The cuts have impacted city pools and parks, economic development services, fire and police, traffic and parking, just about every service you can think of that government provides. The city also sought to privatize its parking meters to bring in increased revenue, a plan that has since been shelved. Other fees will likely follow however. Now imagine a similar scenario playing out in cities and towns across Ohio. Increased fees, increased local property taxes and decreased services. Or click here if you live in Ohio to see the effects and impacts on your county. Similarly, schools districts faced significant cuts from 2012-2014. Funding was cut by $1.438 billion for the 2012-13 budget. Though some of it was restored for the 2014-15 budget, the projected total is still $607.4 million short of 2010-11 funding. Across Ohio, teachers and programs were eliminated or reduced. Class sizes went up and school districts proposed local property tax increases to make up for the lost revenue. 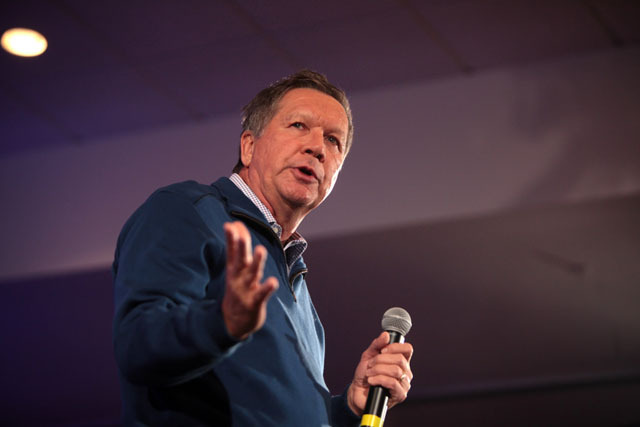 In 2010, the Kasich administration claimed that Ohio faced an $8 billion deficit crisis. What never gets mentioned is that if there was an $8 billion deficit, it was created by the income tax cuts of 2005 and a recession. The 2005 tax cuts reduced revenue with the assumption that the economy would grow and Ohio could bring in more money from a lower rate. However, the economy didn’t grow. It crashed. Quite simply, by 2010, the recession and the 21% cut combined to create the state deficit. In the 2012-13 budget, Ohio paid for an estate tax cut which dropped revenues by another $333.8 million a year. The state also increased funding to charter and private schools by $567 million. Spending from the General Revenue Fund also increased from $50.5 billion to $55.6 billion over 2 years. This is an increase of $5 billion, the second largest increase in state spending in Ohio’s history. I fully realize that it’s kind of counter-intuitive that we’ve closed an $8 billion shortfall and yet spending is growing. Some might even say there wasn’t an 8 billion deficit. In 2013, the state government claimed the cuts to schools and local governments worked. No one is talking about a deficit and suddenly the state has a surplus. So we can restore funding to schools and local governments then, right? Nope. You can probably guess what’s coming. You win the prize if you said tax cuts. Despite evidence that income tax cuts don’t grow the economy or create jobs, the solution is more tax handouts. It looks more like pursuing an agenda of what the national chamber of commerce wants over education, public courts, police, fire, infrastructure and other programs which benefit the citizens of Ohio. And yes, I know the numbers don’t equal each other. This is because the state is not directly taking all of the money from one place and allocating it to another. It’s more as if the money is put into a pot and then reallocated. 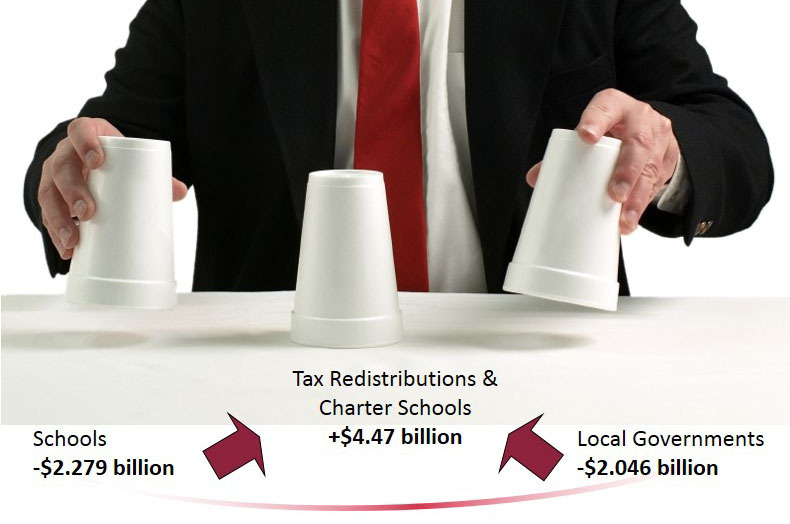 It is interesting, however, how the money taken from schools and communities compares with the money outlays for tax changes and private schools. In the past 2 budgets (2012-13, 2014-15), Ohio has cut over $4 billion from the public sector and increased spending on charter schools and tax changes by nearly the same amount. Cuts to schools and government services are being used to pay for the tax changes groups like ALEC desire. It looks very similar to what’s happened at the national level with the sequester. Create deficit, use crisis to change tax code. Deficits or where the money will come from are rarely brought up when talking about tax changes. The American Legislative Executive Council (ALEC) is pushing similar changes across the country with 2013 successes in: Alaska, Florida, Idaho, Indiana, Iowa, Kansas, New Mexico, North Carolina and Wisconsin among others. Now I could almost buy the sales pitch that this is our money and we should get it back except for one thing. Most people won’t see any difference in their lives from the tax changes. Why? Because the way the tax changes work is through income tax cuts (which benefit the wealthy most) and sales and local property tax increases (which impact everyone else). When you look at the impact of the tax changes in Ohio, the gains mostly go to the top 4%. If you make more than $143,000 a year, you receive a $1,000 cut and if you make over $335,000 a $6,000 cut. Everyone else sees little change as income tax cuts are canceled out by increases in the state sales tax. BTW, the above chart does not show the additional benefit to those with property valued over $338,333 (who no longer have to pay an estate tax) or the impact of local property tax increases as communities raise them to try to make up for lost funding. If you were in the top 1%, you received a $10,000 yearly tax cut in 2005 and another $6,000 yearly tax cut in 2014. If you owned property worth more than $338,333, you also received an estate tax cut in 2013. Where’s the jobs? Where’s the growth? Once again, from 2005 to 2013, we’ve had a 4.4% decline and have lost 238,000 jobs. Over the same period, despite the recession, the nation managed a 1.2% increase. Not even the logic that tax cuts create jobs make sense. If you own a business, you hire people when you have a need or when there’s increased demand. You don’t hire people when someone hands you a check. Now you might spend this check. That could stimulate the economy. However, if you’re going to offer a Keynesian stimulus, a better way to do it would be to put the money in the hands of people who will spend it immediately, not the top 4%. Instead, Ohio is shifting the tax code so the wealthy pay less and everyone else pays more and defunding local governments and schools. Any guesses what’s going to be proposed next? I’ll give you a hint. Arthur Laffer, is making the rounds selling a 0% income tax rate, even though this goes against his own Laffer Curve from the ’80s. Who do you think this will benefit? Write a letter to the editor to help people understand the issue and to prod local media. Go after the idea of supply side economics not a specific person; refrain from ad hominem attacks and wasted energy liberal/conservative fights. Our strength is in numbers, not money. Talk to your friends/relatives and encourage them to do the same. I can’t overemphasize the importance of this. Why are we talking about taxes again when the last round (or rounds) of tax cuts created a deficit and didn’t deliver on jobs and growth? What are you doing to help consumers and the middle class? Do you believe that we all benefit when we invest in schools and communities? At a community forum this past weekend, I was impressed by people speaking out about the impacts at the local level. This is a great sign as the story is starting to get out there. There’s still a lot more to be done though to reverse 40 odd years of supply-side economics. Is this going on in your state?